Innocad Architecture has developed an international reputation for conceiving streamlined projects from New York to Saudi Arabia. Closer to home, the Austrian firm designed Microsoft’s Vienna office. Recently, founding partner Martin Lesjak and his team were the hometown heroes for a project right in their own backyard: the History Museum in Graz, which plumbs the lore of the region, known as Styria, back to the Middle Ages. 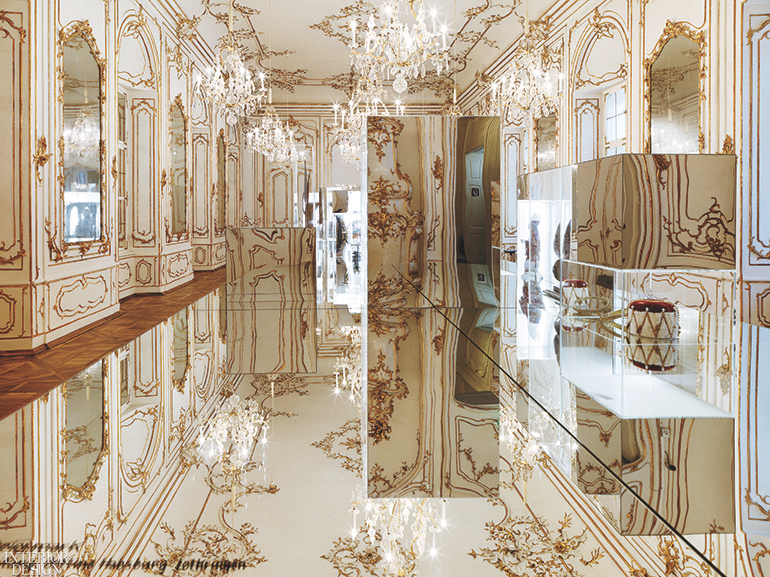 Beneath original chandeliers in “100 x Styria,” custom mirrored casework is part installation, part technology-equipment storage. Photography by Paul Ott. He and his team certainly did so at the palace entrance. Its low, barrel-vaulted ceiling was atmospheric to be sure, but it was also dark and somewhat stifling. Lesjak inserted what he calls an “iron carpet,” an angled pathway that’s in fact steel strips laid down over the existing uneven stone flooring leading into the building. Then, for illumination, the museum commissioned Austrian artist Brigitte Kowanz, who was invited to participate in the Biennale di Venezia last year, to create a Dan Flavin-inspired installation of neon tubes that highlights the ceiling’s vault. 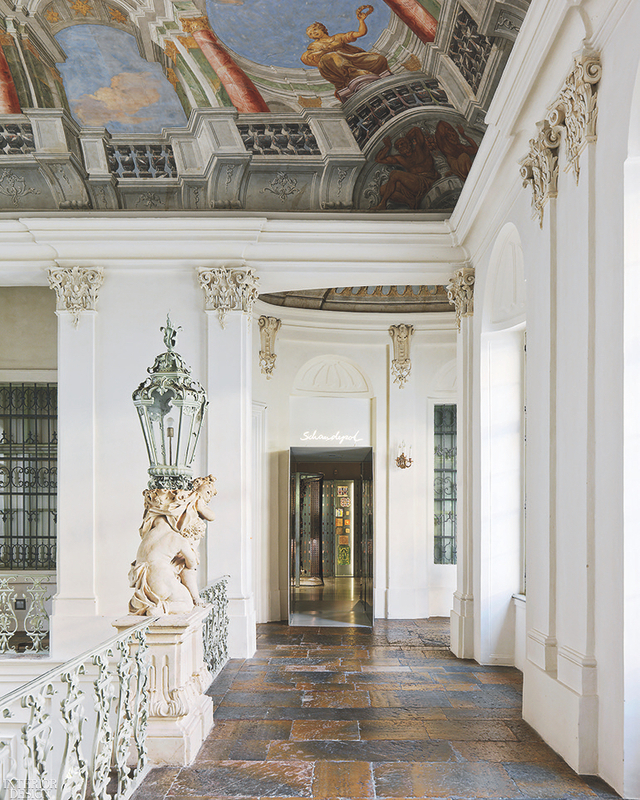 Over the staircase, a 1750’s addition, the ceiling fresco attributed to Styrian 18th-century painter Philipp Carl Laubmann depicts Olympian gods. Photography by Paul Ott. As for the shimmering hall of mirrors upstairs, the solution was... more mirrors. The four adjoining rooms have now become “100 x Styria,” a permanent exhibition designed by Innocad featuring 100 objects from the region’s last 1,000 years, ranging from a circa 1200 bronze bowl to a radio-TV-record player combination from the late 1950s. To display them, Lesjak designed gleaming acrylic vitrines set on mirrored bases. Some of the bases form a simple tablelike shape. “We call it setting the table for history,” Lesjak explains. 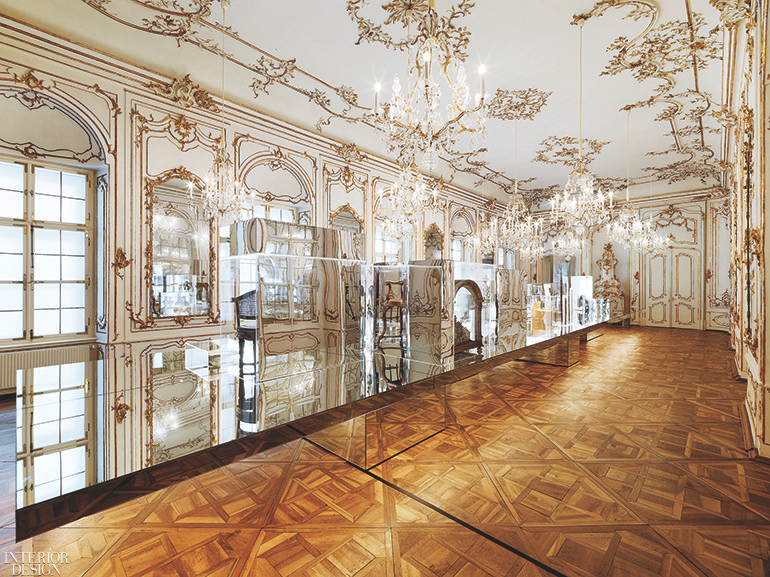 “The objects seem to be floating, you can really focus on them.” One of the rooms, the most ornate of the four, contains only a long mirrored-glass composition. Part installation, part technical-equipment concealer, it’s a “metaphoric and formal reflection of the space, time, and existence,” the architect notes, blurring the lines between past and present. Another portion of the second floor houses the Schaudepot, German for exhibition depot and better known to U.S. audiences as open storage, among the likes seen in the Metropolitan Museum of Art in New York. 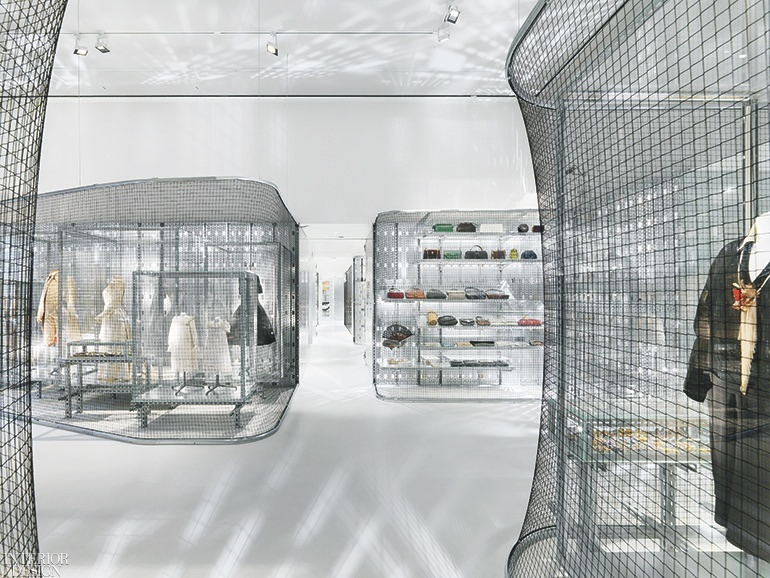 It holds the museum’s 2,000-piece cultural history collection, divided into such categories as fashion, furniture, transportation, and musical in­struments. At its entrance, a sign spelling out Schaudepot in neon script, another Kowanz contribution, comes across as a modern take on the scroll detailing of the existing baroque moldings. Walnut parquet dates to the 18th century. Photography by Paul Ott. 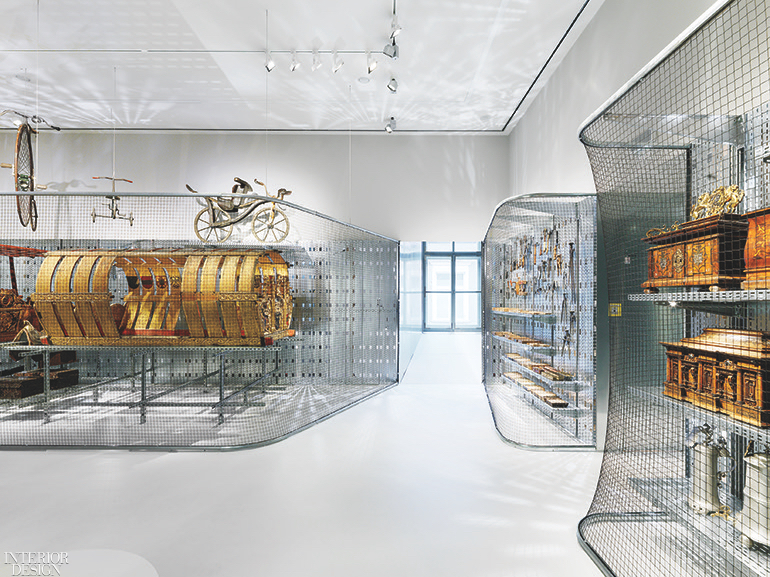 In the Schaudepot’s first section, dozens of objects, from dresses to bicycles, are on display in adjoining rooms. They’re placed inside simple wall-mounted units, their galvanized steel frameworks infusing an industrial vibe, the gray resin flooring adding to the effect. Instead of the units being fronted in glass, however, the objects are placed behind fine netting stretched between rods in the same metal as the frames. The mesh lets light through to the objects without any glare. At the same time, LED spots installed behind the netting cast patterns on the walls and ceiling. The original window openings have been reinstalled, so that the Graz cityscape remains a part of the experience—appropriate for a museum whose setting is, in a sense, its subject—and the light coming in the windows contributes to the shadow play, too. The Schaudepot’s second component is the museum’s 20th-century multimedia collection, a hands-on experience where visitors can sample records and books and even watch films from seats reclaimed from a local mid-century cinema. Perforated screens, in more galvanized steel, line the walls, providing space to hang monitors and hide cables threaded through the back. “Everything is movable, durable, and practical,” Lesjak continues. And it is customizable in the extreme, allowing for the inevitable future changes in technology. Transportation objects such as bicycles and the circa 1450 coach of Emperor Frederick III are part of the cultural history collection. Photography by Paul Ott. Although the clean-lined appearance of the installations is very much in keeping with Innocad’s previous projects, that similarity belies the firm’s inspiration for the project: “We were thinking about old attics, where treasures are stored,” Lesjak says. Though there’s not a musty note anywhere to be found, perhaps that’s a sensible recipe: One part innovation, and the rest, as they say, is history. Project Team: Patrick Handler; Jörg Kindermann; Dominik Gladik; Sigrid Prinz; Amila Smajlovic: Innocad Architecture. Gol Lichtdesign Guardians of Light: Lighting Consultant. Manfred Pet­schnigg: Structural Engineer. Pech­mann: MEP. Norbert Rabl Ziviltechniker: Civil Engineer. Glas Sajko: Glasswork. Ruckenstuhl: Drywall Contractor. Haring & Marx: Flooring Contractor. Product Sources: Eldax Fieldsolution: Shelving. Berger: Custom Netting. Sika Österreich: Resin Flooring. ERCO; L&L Luce & Light: Track Lighting. LED Linear; Volas Lighting Tools: Cove Lighting. Oz Lighting: Recessed Ceiling Fixtures. NEONline Werbedesign: Neon Fixtures.